As animals who are preyed upon, horses are tuned in to the slightest inconsistency in their environment. They recognize and reflect back to us our own inconsistent behaviors – behaviors we may not have been aware of that stop us from being effective leaders. As animals whose survival depends on a cohesive herd, they teach much about working together effectively in team settings. Leaders who feel they must hang their hearts at the office door while their heads take over the workday do not thrive. In working with leaders from small businesses to Fortune 500 companies, from government agencies to boards of directors, I have found that when a leader is encouraged to balance head and heart, that leader not only grows and thrives, but becomes more effective. 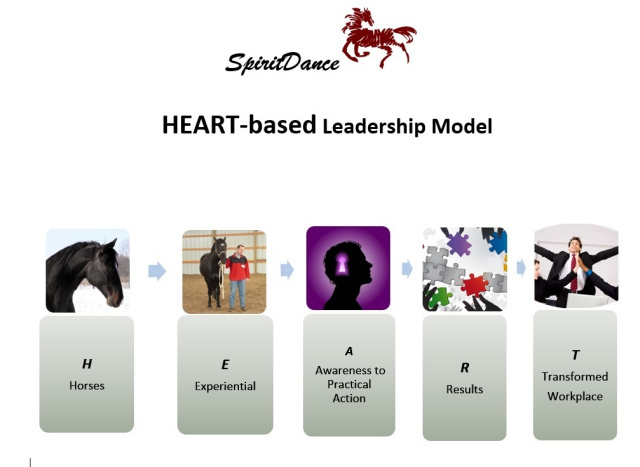 Go See a Horse programs are based on the SpiritDance HEART-based Leadership Model. H - Horses. Horses tell us when we are fooling ourselves and when we are authentically lined up with our own truth. They demand congruence of head and heart if they are to follow willingly, and they teach us how to come into and operate from that powerful place of alignment. E - Experiential. All SpiritDance Leadership Training and Teambuilding programs are Experiential. This means that you will touch horses, smell the fields and the barn, have your feet on the earth. You will move, respond, use your body. In fact, the first point of learning is your body. After the fact, the mind can then process what happened and make practical applications to real life. Experiential, body centered learning sticks. A - Awareness to Practical Action. 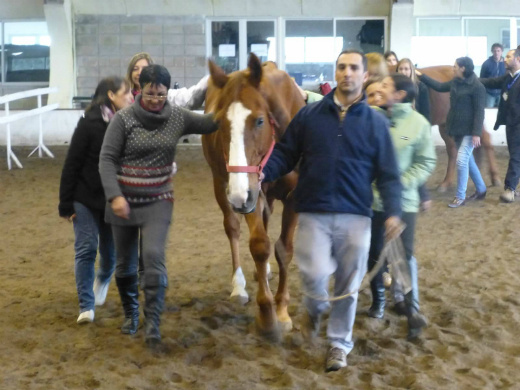 Working with the horses and trained coach/facilitators elicits high levels of self-awareness. Horses reflect back to us how we show up, how we affect others, what we are feeling and thinking, and as mentioned earlier, when we are fooling ourselves and when we are on the right track. Because horses don't care how much money we make, what our position is, or what kind of car we drive, they give us straight feedback -- and while it's sometimes easy to dismiss the thoughts of a colleague or especially a subordinate, it's hard to argue with a horse. The non-judgmental feedback we get from the horses about how we're being in the world is easy to translate into practical behavior change at the office. And the good news is, the horses also reflect back to us strengths which we were previously unaware of . T - Transformed workplace. Unlike other kinds of training, the learning and the metaphors that you take away from your Heart-Based Equine Guided Leadership Training stay alive in the day to day culture. This work "percolates" over time. The learning resides in the body and in the language of the workplace. Because horses get to the heart of the matter, old, stuck paradigms shift unexpectedly, offering new, innovative approaches to employee relations and successful results. I have been doing leadership training and team development since 2003 as co-owner of Wisdom Horse Coaching, now dissolved, and through my own company, SpiritDance, where I continue to provide leadership training for highly functioning executives as well as large and small teams. I also assist other professionals whom I have trained or helped train, to consult for and co-facilitate corporate trainings they are leading. In addition, I work with other coaches to provide equine guided leadership training as a powerful addition to their existing leadership training programs. It's always a pleasure to have leaders and teams out to the farm, spend time in nature, and let the wisdom of the horses do its work. Here is a video clip from a past program. I'm the facilitator with the dark hair. In addition to our half- and full-day Go See a Horse Programs, we also offer Equine Guided Leadership and Team Building Programs custom designed just for you. Choose a one- to five-day program. Venues in the Minneapolis-St.Paul, Minnesota area, Tucson, Arizona, or will travel to site of your choice in the U.S. or abroad. 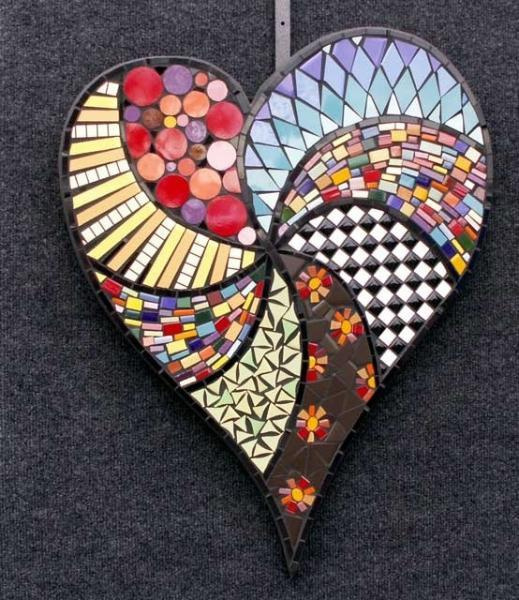 Please contact Lynn Baskfield to book and build your HEART-Based Leadership Training.